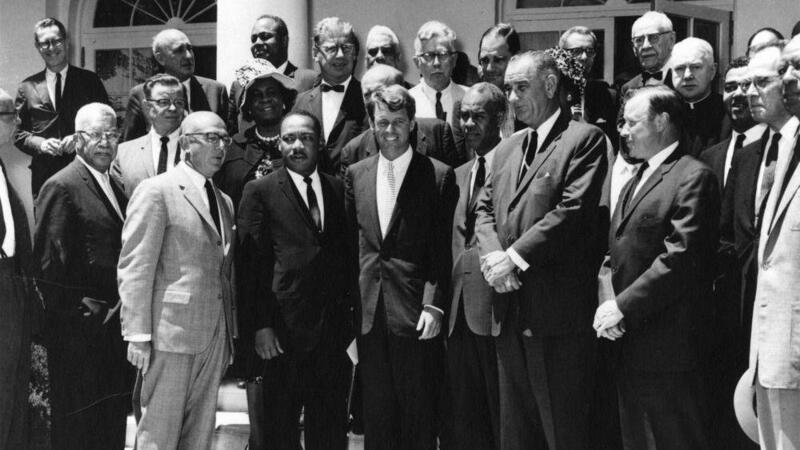 Benjamin Epstein, director of the Anti-Defamation League, stands on Martin Luther King Jr.'s right in this photo with Attorney General Robert F. Kennedy and Vice President Lyndon B. Johnson, taken June 22, 1963. 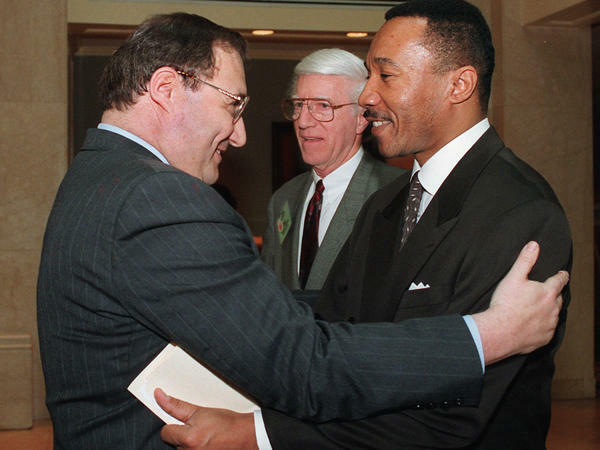 NAACP President and Chief Executive Officer Kweisi Mfume (right) embraces Anti-Defamation League National Director Abe Foxman in Washington prior to an April 22, 1996, discussion titled "Black/Jewish Relations and the Future of the East Civil Rights Movement." Foxman led the ADL from 1987 to 2015. The Jews who immigrated to America in the early 20th century brought with them their history as a persecuted people. Many were fleeing pogroms and anti-Semitic attacks in Europe, and those experiences bonded them to other groups that also faced discrimination. The Anti-Defamation League, founded in 1913, was established by Jewish leaders to stop "the defamation of the Jewish people" but also "to put an end forever to unfair and unjust discrimination against ... any sect or body of citizens." That mission led to an early alliance with African-Americans, one that bore fruit in the civil rights movement. "As I think about the work between the NAACP and the ADL, it is indeed an intersection in values, a convergence in interests," said NAACP Vice President Hilary Shelton, speaking at a recent ADL "leadership summit" in Washington. Shelton noted that Jewish civil rights activists Michael Schwerner and Andrew Goodman were murdered in Mississippi along with their African-American colleague James Chaney in 1964 while promoting African-American voting rights. "I thank God for that leadership, and ADL was there too," Shelton noted. A year later, ADL President Benjamin Epstein marched alongside Martin Luther King Jr. in Selma, Ala. In subsequent years, mostly under the leadership of ADL President Abraham Foxman, the League was focused primarily on fighting anti-Semitism, but the League's new president, Jonathan Greenblatt, wants the ADL to renew its old civil rights activism and move the work forward. "There's questions like mass incarceration, the school-to-prison pipeline, economic opportunity," Greenblatt told NPR in a recent interview. "We need to integrate what's happening with the Latino community [and] the LGBT community, because when we fight for the rights of others, it strengthens America. It makes America a better place." There is just one complication. For many current civil rights activists, solidarity with Palestinians is taking precedence over the old solidarity with American Jews. "Many of our experiences of police repression and brutality seem to mirror that of many international peoples, including [people in] Palestine," says the Rev. Mike McBride, a prominent African-American pastor from Berkeley, Calif., who became involved with the Black Lives Matter movement after the shooting of Michael Brown in Ferguson, Mo. "When we were in Ferguson, and we were being terrorized by the law enforcement and military apparatus," McBride says, "it was Palestinian young people who started to tweet us on how to survive and deal with the terror we were experiencing." McBride and other Black Lives Matter activists recently traveled to the Middle East to meet with Palestinians. He says they came away impressed by their "overlapping" experiences. And it's not just the Black Lives Matter movement that is drawn to the Palestinian struggle. Earlier this year, a group of pro-Palestinian gay-rights activists disrupted a meeting in Chicago of the National LGBTQ Task force, an umbrella organization that includes several groups that advocate for LGBTQ rights. A delegation from Israel was invited to the meeting, and the protesters took advantage of the occasion to condemn the Israeli occupation of Palestinian territories. About 200 marched through the meeting site, shouting, "Hey, hey, ho, ho, occupation has got to go!" and "From the river to the sea, Palestine will be free!" The task force executive director, Rea Carey, was forced to cancel the meeting, but not out of sympathy with the protesters. A few months later, she was among the speakers at the Anti-Defamation League leadership summit in Washington, promoting the cause of LGBTQ rights. The ADL's long-standing support for Israel did not dissuade her from participating in the meeting. "One of the lessons I've learned is that being in relationship is critical to working through conflict," she told NPR. "It's when we isolate ourselves that we end up getting in trouble." Alliance-building has clearly become more challenging. The ADL's Greenblatt supports LGBT rights and sees Black Lives Matter activism as "deep and real," but the perceived intersection of those movements with the Palestinian cause is making his advocacy work more difficult. "Increasingly, we've seen folks on campuses say, [with regard to] this intersectionality ... 'If we believe black lives matter, we therefore also must be anti-Israel and pro-Palestinian,' " he says. " 'Because we are for, you know, reproductive rights, we are against Israel.' I mean, generally speaking, I find that specious. I think we need to look at each issue on its own and consider it on its own." For Greenblatt and others, the story of civil rights collaboration in the 1960s remains inspiring as an example of how leaders can work together across racial and religious lines. Huddling with Shelton of the NAACP during a break at the recent ADL conference, Greenblatt pulled up a photo on his cellphone. It was a picture taken in the White House Rose Garden in June 1963, shortly before the March on Washington. The ADL's Epstein is standing alongside Martin Luther King Jr., Robert F. Kennedy, NAACP Executive Director Roy Wilkins and Vice President Lyndon B. Johnson. "That's intersectionality," Greenblatt told Shelton. "And thank God for it," Shelton said. Greenblatt, 45, formerly a successful social entrepreneur and special assistant to President Obama, was not yet born when the picture was taken, but he uses it to promote the ADL's continuing commitment to progressive causes that go beyond its traditional focus on anti-Semitism. Among those Greenblatt invited to his recent leadership conference was Glenn Martin, who spent six years in prison in New York and now heads JustLeadershipUSA, an organization that fights mass incarceration, with special attention to young African-American men. Like Carey, Martin says the ADL's commitment to Israel did not keep him from attending the ADL's leadership summit and appealing to its members for support. In an interview, he said he thinks it's good for the ADL members to be exposed to experiences they might not normally encounter. "I'm invested in bringing the voice of people most impacted into a space where [other] people may not be hearing that truth and really challenging them on their privilege and access," he said, "and whether or not their work has the values that their rhetoric suggests that it does. " The new landscape of political activism was evident in Ferguson in the days and weeks after Brown's shooting. Activists from the Black Lives Matter movement, energized and angry, bitterly attacked the ADL over its connection with Israel. The ADL director in St. Louis, Karen Aroesty, came away chastened by the experience and realizing that activists today have different expectations of their allies than their predecessors did. "New anti-racism activists aren't impressed by, 'We marched with you in Selma,' " she says. "It doesn't go anywhere. It's a long time ago." The solidarity work done today is around specific, concrete goals and problems. Aroesty notes that her ADL chapter in St. Louis assists the U.S. attorney's office in staffing its Hate Crimes Task Force. But given the disagreements on issues such as the Israeli-Palestinian conflict, even greater efforts may be necessary to make the Anti-Defamation League a consistently valued civil rights partner in a time of divided loyalties. Now a story about the difficulty of building partnerships in the fight for social justice. With their own history as a persecuted people, American Jews bonded early with African-Americans and other groups facing discrimination. But those alliances are weakening for reasons that NPR's Tom Gjelten explains. TOM GJELTEN, BYLINE: Just over 100 years ago, when Jews were fleeing pogroms and anti-Semitic attacks in Europe, Jewish leaders in the United States established the Anti-Defamation League. Its mission was to stop unjust and unfair discrimination against, not just Jews, but any sect or body of citizens, thus, an early ADL alliance with civil rights leaders, an alliance highlighted recently by NAACP Vice President Hilary Shelton speaking at an ADL meeting. HILARY SHELTON: (Unintelligible) I think about the work between the NAACP and ADL. It is indeed an intersection in values, a convergence in interests. GJELTEN: That solidarity was evident in 1964, Shelton said, when three young civil rights activists, an African-American and two Jews, were murdered in Mississippi. At the time, Jewish organizations were supporting the drive for voting rights. SHELTON: I thank God for that leadership. And ADL was there, too. GJELTEN: And a year later, the head of the ADL marched alongside Martin Luther King in Selma. The Anti-Defamation League's new president, Jonathan Greenblatt, wants the ADL now to move its civil rights work forward. JONATHAN GREENBLATT: There's questions like mass incarceration, the school-to-prison pipeline, economic opportunity. We need to integrate what's happening with the Latino community, the LGBT community because when we fight for the rights of others, it strengthens America - makes America a better place. GJELTEN: There's just one complication. For more and more civil rights activists these days, solidarity with Palestinians is taking precedence over solidarity with American Jews. MIKE MCBRIDE: Many of our experiences of police repression and brutality seem to mirror that of many international peoples, including Palestine. GJELTEN: Pastor Mike McBride is a prominent African-American pastor from Berkeley, Calif., who became involved with the Black Lives Matter movement after the shooting Michael Brown in Ferguson, Mo. MCBRIDE: When we were in Ferguson and we were being terrorized by the law enforcement and military apparatus, it was Palestinian young people who started to tweet us on how to survive and deal with the terror we were experiencing. GJELTEN: McBride and other Black Lives Matter activists recently traveled to the Middle East to meet with Palestinians. He says they came away feeling they had overlapping experiences. And it's not just the Black Lives Matter movement joining forces with Palestinians. Earlier this year, pro-Palestinian gay rights activists disrupted a meeting in Chicago of the National LGBTQ Task Force. A delegation from Israel was at the meeting. And the protesters used the occasion to condemn the Israeli occupation of Palestinian territory. UNIDENTIFIED PROTESTERS: (Chanting) Hey, hey - ho, ho - occupation has got to go. Hey, hey - ho, ho - occupation has got to go. GJELTEN: Rea Carey is the executive director of the task force whose meeting was disrupted. But she was not deterred from showing up at the Anti-Defamation League leadership summit to address LGBT issues. For her, the ADL's support for Israel was not a factor. REA CAREY: One of the lessons I've learned is that being in relationship is critical to working through conflict. It's when we isolate ourselves that we end up getting in trouble. GJELTEN: Alliance-building is clearly getting more challenging. The ADL's Greenblatt supports LGBT rights and Black Lives Matter. But the perceived intersection of those movements with the Palestinian cause has made his advocacy work more difficult. GREENBLATT: Increasingly, we've seen folks on campuses say it is intersectionality why, if we believe black lives matter, we, therefore, also must be anti-Israel and pro-Palestinian. Because we are for, you know, reproductive rights, we are against Israel. I mean, generally speaking, I find that specious. I think we need to look at each issue on its own and consider it on its own. GJELTEN: It's tempting to yearn for the time when civil rights actors worked together easily. Huddling with Hilary Shelton of the NAACP at the recent ADL conference, Greenblatt pulls up a photo on his cell phone. It's a 1963 picture taken in the White House Rose Garden. Roy Wilkins of the NAACP and ADL president Ben Epstein stand alongside Martin Luther King, Bobby Kennedy, Lyndon Johnson and others civil rights leaders. GREENBLATT: MLK, RFK, LBJ - there you go. SHELTON: And thank God for it. GREENBLATT: You better believe it. GJELTEN: That's intersectionality, Greenblatt says. He wasn't yet born when the picture was taken. But it inspires him. He's determined to maintain and expand the ADL's reputation for supporting progressive causes beyond its traditional focus on anti-Semitism. Among those he invited to his recent leadership conference was Glenn Martin who spent six years in prison in New York and now heads an organization that fights mass incarceration. Martin says he wants the ADL to support his work. And he thinks it would be good for its members to be exposed to experiences they might not normally encounter. GLENN MARTIN: I'm invested in bringing the voice of people most impacted into a space where people may not be hearing that truth and really challenging them on their privilege and access and whether or not their work has the values that their rhetoric suggests that it does. GJELTEN: The new landscape of political activism was evident in Ferguson, Mo., in the aftermath of the Michael Brown shooting. Activists from the Black Lives Matter movement, energized and angry, bitterly attacked the ADL over its connection with Israel. The ADL director in St. Louis Karen Aroesty came away from that experience realizing that activists today have different expectations of their allies. KAREN AROESTY: New anti-racism activists aren't impressed at all by - we marched with you in Selma. It doesn't go anywhere. GJELTEN: It was 50 years ago. AROESTY: It's a long time ago. GJELTEN: The marching that's done today is around specific goals. The ADL in St. Louis helps staff the U.S. Attorney's hate crimes task force in the region. The question is, given disagreements on other issues, whether such support roles are enough to make a group like the Anti-Defamation League a valued civil rights ally. Tom Gjelten, NPR News. [POST-BROADCAST CLARIFICATION: In the audio, as in a previous Web version, we say that Jonathan Greenblatt supports LGBT rights and Black Lives Matter. The description of Greenblatt's view of the Black Lives Matter movement has been reworded in the Web article to reflect that it is not an official endorsement.] Transcript provided by NPR, Copyright NPR.